Aaaaaahhhhh. That is the sound of me settling into one of my favourite genres, a first for my reads for this blog. Fantasy, my first and if I am honest, favourite, reading love. I was pleasantly surprised to see this book on the list. I expected Tolkien, but more modern epic fantasy was not and therefore became an easy one for me to tick off the list. 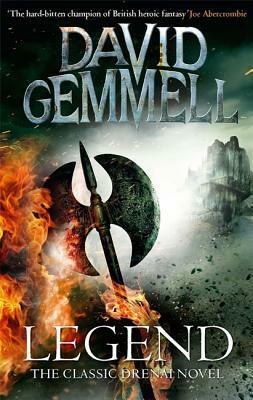 And for all my fantasy adoration, the Drenai Saga, of which this book is the first of thirteen, is not a Gemmell I had read before. So what more of a push did I need? As is typical of many fantasy novels, there is a large supporting cast of characters. Joining Druss in this supposedly doomed campaign is Rek, running in the opposite direction of the fighting due to his crippling fear. Then fate steps in and Rek not only finds himself joining the battle, but also leading it. Our mystical element is provided by the albino Serbitar; he and his monk-like group known as The Thirty join the battle physically and metaphysically, reading futures, foretelling betrayals and fighting off psychic attacks. A beautiful serial killer, farm hands who rise to the challenge, pampered officials, all come together in a battle that appears to have been lost before it is even fought. Get rid of your doubts. Yesterday is dead. Past mistakes are like smoke in the breeze. What counts is tomorrow, and every tomorrow until Woundweaver gets here with reinforcements. Make no mistake, Orrin. When we survive and the songs are sung, you will be worth your place in them and no one will sneer. Not a soul. Believe it! Where Legend is successful, is in the pacing. There are 13 novels in the Drenai saga, but many can stand alone for they are not one continuous narrative as many other fantasy series. What this allows for is a fast pace with no need for padding with long speeches or descriptions of surroundings. The second half of the book is all battle and it makes for thrilling reading. These are not minor skirmishes, but a battle in the truest, grandest sense with the relevant death toll. The glimpses we get of Ulric and his Nadir help to raise the suspense and anticipation of what could possibly come next. This is a great introduction to fantasy for those who have yet to try it but always wanted to. When putting my mind to why this was chosen as the selection above others such as Feist, Jordan or Eddings my opinions is that it succinctly defines much of what the genre has to offer in one book that can stand alone or be a gateway to more books in the series. It is not overly complicated, as some of the plots and sub-plots can be in long series (I’m looking at you Mr. Martin; nothing but frustrated adoration for you from me though). I thoroughly enjoyed it and will be passing it on to my son who has already devoured another of Gemmell’s works and is eager for more. Highly recommended.